Galloway and Skwawkbox lead Corbyn Defenders on Brexit. As Far-Right British Gilets Jaunes Harraras Pro-Europeans Left Should Take Lead in Fighting Brexit. Labour Policy on Brexit after this year’s Conference. There has been a rush of articles today in mainstream outlets on a common theme – supposed remainer horror and condemnation over Labour’s plan to continue with Brexit if successful in winning power. So much so, that many left-wingers consider it a(nother) coordinated, establishment attack on Labour and its leader. It’s pure coincidence that all these articles contain quotes from the same dreary people saying the same dreary thing. And it’s irrelevant that these articles omit the obvious: that to win power, as the party has a duty to the huge numbers suffering under the Tories to do, Labour cannot pour contempt on the views of the many millions of people who voted – and still want – to leave the EU. Not only that, but in 2016 Corbyn was re-elected as Labour leader – with an increased share – promising to respect the referendum result and less than three months ago, Labour’s conference endorsed his policy to fight for a general election and negotiate Labour’s Brexit. No, all this is complete happenstance and anyone who doubts the integrity of the UK’s ‘fourth estate’ is part of the problem. It’s the independent left media that is fake news, after all. Speaking in favour of the motion, Sir Keir Starmer, the shadow Brexit secretary, received a standing ovation when he told the conference hall that remaining in the EU could be an option in any future public vote. He said: “It is right that Parliament has the first say but, if we need to break the impasse, our options must include campaigning for a public vote and nobody is ruling out Remain as an option. And he struck a distinctly Eurosceptic note by again highlighting Labour’s concerns about the state aid rules that form part of the architecture of the single market. Neither is he willing to countenance the idea that Labour should support May’s deal, to avoid Britain crashing out with no deal in place at all – a move the prime minister has repeatedly said is in the “national interest”. “The national interest is for parliament to have a vote on this deal now,” Corbyn said, pointing out that it was May who had pulled the vote, which MPs had agreed to hold on 11 December. In his party conference speech, Corbyn surprised some activists by saying Labour could back the prime minister’s deal if she secured a permanent customs union and offered stronger assurances on workers’ rights and environmental standards. To put is simply, the ‘I’ says, he now stands with the sovereigntists, right and left, “Mr Corbyn also said he would advocate Brexit if there was a second referendum on the issue. Galloway has taken to attacking left-wing pro-Europe MP Clive Lewis. At the moment Labour is not only holding a second referendum at arms-length but it is talking about, in the event of winning an election, negotiating a better Brexit deal than May has managed! This in my view would be disastrous. Being against Brexit means being against the reopening of negotiations on Brexit. Brexit cannot be turned into “left exit” or Lexit because there is no Lexit possible in the present situation. Brexit has its origins and dynamic as a right-wing project and it will remain a right-wing project. The negotiation by Labour of a slightly less bad deal than May that would inevitably be inferior to the current membership conditions of the EU itself would be seen as a betrayal by very large sections of Labour’s base, not least young people. Labour must have a clear anti-Brexit stance. It should put a referendum on Brexit in its manifesto making it clear that the vote would include an option to stay in the EU. This is the only way to clearly take the leadership of the anti-Brexit movement. The reality today is that only a second popular vote can credibly stop Brexit and not a general election – which continues to be the Labour leadership’s priority – unlikely as it is to happen between now and the Brexit date. Brexit is on the ropes and can be beaten. A second referendum is now an achievable demand, but only if the Labour fully backs it and makes it happen. The left should take this situation extremely seriously. A crash-out Brexit would take the country sharply to the right and create a ruthless race to the bottom in which the poorest would be hit the hardest. If Labour is seen as bringing this about even by default (for example by failing to back a second vote early enough), it could pay a heavy price amongst its base. On the other hand, if Labour championed a second vote with an in-out option it would take the leadership of a still growing mass movement and could win a big majority. We have to have a way forward at this stage that does not have its origins in racism and xenophobia if we are to get out of the situation that Cameron and Osborne plunged us when they chose the first referendum to settle scores in the Tory Party. When the vote comes in Parliament, therefore, Labour must not only vote down May’s deal and oppose a no-deal crash out by default. It must also back the suspension of Article 50 in order to create the space for a second referendum with the option of staying in the EU. This is not because we have any illusions in the EU or think that it can be reformed from within. It is because the present course set by Brexit, or any credible variants, is set to provide a big victory for the right, the impoverishment of large numbers of people and threaten the future of an anti-austerity government led by Jeremy Corbyn. It’s quite clear what the party’s policy is, and it is not what Corbyn is shovelling. At party conference, the vast majority of delegates were pushing for a clearer policy that would have committed the party to opposing Brexit outright, whether by a General Election, or support for another referendum. Only after a lot of arm twisting was the composite motion agreed, in the interests of party unity. But, the clear intention of that composite to was to back a strategy that worked towards a General Election, or another referendum, in which Labour would argue for Brexit to be scrapped. That is why Starmer, made clear in his conference speech on the composite that if that process resulted in Labour backing another referendum, that referendum would have to include the option of Remain. Current estimates are that 90% of party members support Remain. The only rational position on which Labour could call for a General Election or another referendum, would be on the basis of calling for Remain, and scrapping Brexit. Corbyn is setting himself against 90% of party members, and around 75% of Labour voters, by pushing ahead with his reactionary dream of Brexit as part of a Stalinoid programme of Social Democracy in One Country, egged on by his Stalinist advisors, from the Morning Star, and Socialist Action. Such a programme would destroy Labour for a generation. Even compared with a Blair-right Labour Party such a development would be reactionary. Its only necessary to look at the calamity that befell the working-class in Eastern Europe, China, Vietnam, and Cuba as a consequence of Stalinism to recognise that. In Russia, millions starved to death as a result of Stalin’s crazy economic policies, and the police state erected to push them through; in China millions more died as Mao’s economic nationalist policy of The Great Leap Forward, amounted to driving the country back decades, if not centuries, in terms of its economic potential. And, everywhere that Stalinists have been allowed to pursue such a course, not only has it led to such economic chaos, but it has led to the erection of the most grotesque, bureaucratic and totalitarian regimes. The party rank and file must call Corbyn and the leadership to account for their betrayal of party members and basic socialist principle. Party branches should flood the NEC with motions and demands for a recall conference to decisively commit the Party to opposing Brexit, for the revoking of Article 50, and for the calling of a General Election on that basis, in which Labour will set out the reactionary nature of Brexit, and its opposition to it. It should set out our commitment to working with socialists and workers organisations across the EU, to fight for a Workers Europe, as I set out some time ago, we should build a Socialist Campaign for Europe. Its clear that we cannot trust Corbyn, who has put his own personal commitment to the reactionary economic nationalist programme of Stalinism above the needs and wishes of party members and of British workers, with his continued backing of Brexit. Its time for him, and his Stalinist advisors to go. We need a new leader committed to the principles of socialist internationalism, to oppose Brexit, and build a progressive socialist movement across Europe. Kate Hoey MP, Faces De-Selection Call – “a highly principled woman I have known for 40 years” – George Galloway. “..a highly principled woman I have known for 40 years.” – George Galloway. Activists in Vauxhall, south London, unanimously backed a motion of no confidence in the MP and called for party bosses to suspend the whip from her. They also said she should be made “ineligible for re-selection or endorsement as a Labour party parliamentary candidate”. And they accused her of “collaborating” with Tory Brexiteers and the DUP and “propping up a failing government”. Ms Hoey has faced a barrage of internal criticism after she was among four Labour MPs who helped the Government defeat an attempt to force Britain to sign up to a customs union with the EU. The no-confidence motion claims that defeat in the Commons vote could have brought down the Government and led to a general election that Labour was “widely expected to win”. However, the backbencher vowed to take on attempts to push her out, despite conceding that those in her Lambeth seat voted overwhelmingly in favour of staying in the EU. The MP told the Guardian in a statement that the motion was “not a surprise”. “My local party activists are solid EU remainers. I will always put my country before my party and helping my constituents is a priority,” she said. The motion carries no official force, but local members hope it will pile pressure on the leadership and that it could lead to a so-called “trigger ballot” to remove her ahead of the next election. The Constituency Labour Party motion on Thursday read: “In June 2017 Kate Hoey was elected on a manifesto which explicitly rejected Theresa May’s approach to Brexit and pledged in a letter to constituents that she endorsed Labour’s plans. In her report to the meeting, Ms Hoey said: “Whilst many of you may disagree with my views, I have voted in line with the manifesto and the result of the referendum – to leave the single market and the customs union. Yes, she had nobody to back her as Shiraz also points out. 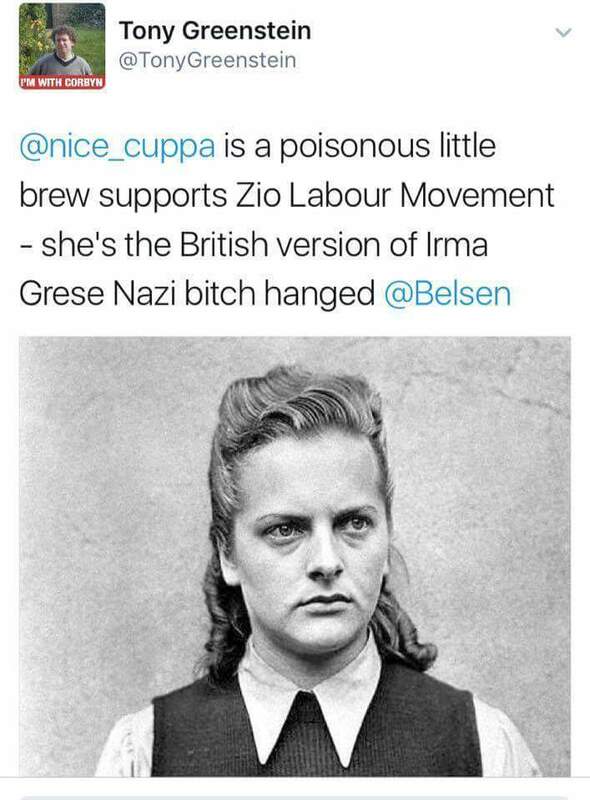 Kate Hoey has, as the former leader of Respect’s Tweet picture indicates, a past on the radical left. She was a member of the International Marxist Group (IMG). Living in London in the early 1970s she became a vice-president of the NUS. [Jack Straw was NUS president at the time]. Returning from an overseas conference, she found herself sitting next to Tariq Ali on the plane. Tariq persuaded her to join the IMG, which she did in summer 1971. In subsequent years she used to muddy this connection by claiming that she was in the Spartacus League, a short lived youth wing of the IMG. She was never at ease with the Irish Republican Trotskyism of the IMG and was also very inimical to Gery Lawless an IMG member at the time. She felt that having Lawless as a member discredited the IMG. Under the influence of Brian Trench [political influence of course!] she joined the IS in 1972 but her stay there was also limited. She joined Hackney Labour party and supported the Troops Out Movement for a period before becoming a supporter of the BICO front organisation, Campaign for Labour Representation in Northern Ireland. She also became vice-president of the National Union of Students, and was briefly was a member of the International Marxist Group, because it “probably had better-looking young men” than other radical-left groups. As ex-IMG myself I can’t disagree with that. During the Europe Referendum Hoey made herself conspicuous by appearing with Nigel Farage, and, at the risk of repeating the message of the picture which heads this post, popped up with Galloway at least once on his RT ‘show’. Hoey blames her party’s “extremely unpatriotic” outlook for its increasing alienation from its traditional working class supporters. “They feel very strongly about their country and we have been extremely unpatriotic as a party to our country. There’s just a feeling that we’re half-hearted about being British, we’re half-hearted about the monarchy, we’re half-hearted about the way we see our country in the world. I’m very proud of being British and I think the United Kingdom is a force for good in the world and we seem to feel all the time that we have to put ourselves down because somehow that might upset people”. New Statesman. 17th of June 2015. Another prominent supporter of Brexit was the man who recruited her to the IMG, Tariq Ali. LIke Kate Hoey Ali was happy at the Leave vote, “Tariq Ali ‘Pleased’ Brexit Has Given EU ‘Big Kick’ up ‘Backside'” reported the Venezuelan repressive regime mouthpiece TeleSur on the 24th of June 2016. Ali’s expressions of solidarity to his old comrade-in-arms Hoey are yet to be made public. George Galloway and Ken Livingstone in Eagerly Awaited Beanfeast. Galloway is a busy bunny these days. 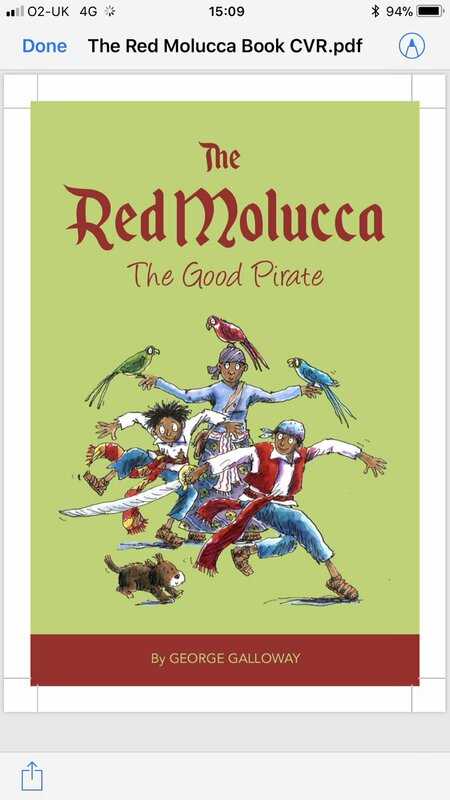 To past glories such as, Dusty Springfield, the musical (2010) and children’s books about an ‘ethical pirate’ (2017, we have this, the Show of the Century! Coming up from D-Day the 6th of June: a brand new show Topple Galloway: topical gorgeousness, irreverence and lacerating commentary topped off with ribald repartee. 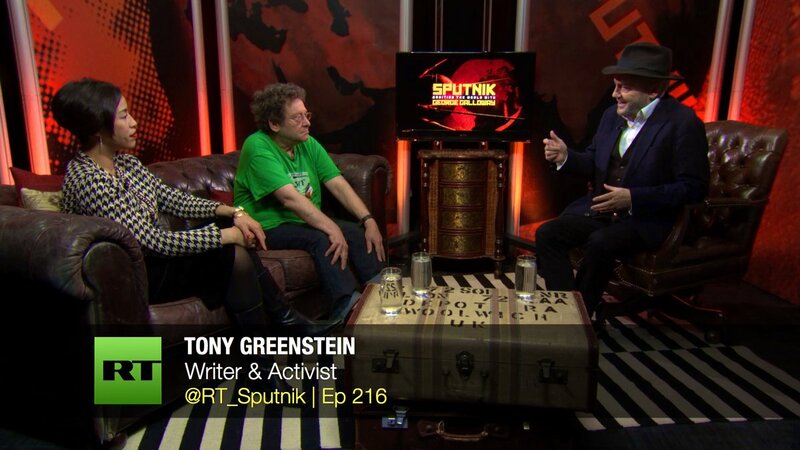 George Galloway joins vocabulary forces with independent journalist and commentator Steve Topple of the canary.co. Tune in on Tuesdays for two of Britain’s top talkers in one show! Here is the some Wit from noted Japester Steve Topple. "Where's Jeremy Corbyn?" chants the #PeoplesVoteMarch. Bit busy on a prearranged visit to refugee camps, while you middle class, liberal nitwits have a jolly nice day out.